The Youngs' Journey: Haiti…no…Central Asia…ah…Uganda…Central Asia! I have now "officially" been the leader of three different teams this Spring. Through it all we prayed for God's guidance in all matters and now that all is resolved, we can clearly see His guidance in all things. The months of project approval, volunteer recruitment and preparations are finally coming to an end: it's now "go time" for the Spring project cycle. First however, much has happened the past six weeks since my last post, so let me fill you in. SUMMIT MEETINGS IN CALGARY. 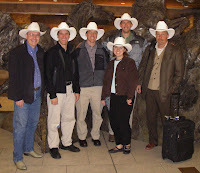 During the first week of May, five senior staff members of eMi USA came up to Calgary for a series of meetings with our growing staff. From exciting envisioning meetings to dry (but necessary!) administration topics the week was intense but ultimately encouraging. Although legally separate entities, there is no denying the unity of vision and inherent DNA in the ministries conducted under the banner of Engineering Ministries International. RETURNING STAFF AND FOUR NEW INTERNS. Also in May we welcomed the return of our part-time staffers, Patrick Cochrane and his wife Joan. This year Patrick wears the mantle of Intern Coordinator and has helped to formalize our intern program, using eMi USA as our model and sounding board. Rose (UBC - Engineering), Wes (Royal Military College - Engineering), Sarah (U. of Guelph - Engineering) and Evangeline (U. of Illinois – Architecture), are our four interns this summer. Rose and Wes are traveling with Kevin to Haiti while Sarah and Evangeline are traveling with Steve to Uganda. Our little office is filled to its limits, going from two to eight in just two months! THREE PROJECTS ON THREE CONTINENTS. Three out of thirteen international projects being conducted under the banner of eMi this Spring cycle is being led out of the Canada office. Haiti. Kevin, just seven weeks on staff is already conducting his first trip as Project Leader. He is currently co-leading a team with eMi Central America Director, Tom Bastian, to Haiti to design new orphanage facilities for God’s Littlest Angels (http://www.emiworld.org/projectprofile_5429.html). This wonderful orphanage is already home to 200 infants and toddlers and ultimately will have the capacity to be home to 300 infants and toddlers. Besides site planning and building design the team will be exploring wind power technology to reduce the cost of operations for this busy home. Uganda. Steve, eMi Canada director, will be leading a team to Mukono, Uganda to design a medical clinic and a hospice care home for Reach One Touch One Ministries (ROTOM). ROTOM serves the needs of poor and homeless seniors, an often neglected and forgotten part of society (http://www.emiworld.org/projectprofile_5431.html) when it comes to aid and mercy ministries. Central Asia. From June 15th to the 26th, I will be headed to Central Asia with a team to master plan and initiate design for a school that serves the educational needs of missionary kids. The parents of the 200 students are missionaries with 34 different missionary organizations. As their parents work to spread the Good News of Jesus to the people of this region, considered the least reached in the world, the students will be looking to this international school to receive an education at Western standards. Our master plan will enable expansion to 500 students and include both boarding facilities and staff housing (http://www.emiworld.org/projectprofile_5430.html). Thank you for coming alongside us on this journey. We are always thankful for you.